SAGE ’08: What’s in The White Box? 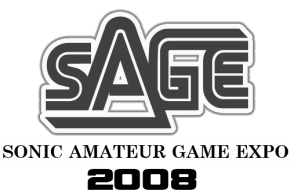 The White Box was among the first games officially announced for SAGE…but no one really knew what it was about, other than there would be some Sonic component to it. We’ve obtained some new information on it, and that Sonic component remains in the form of Sonic Puzz, a puzzle-genre title. But it turns out fan game developer Huepow00 has two other elements to the ‘Box. The land of Verdriet is besieged by the evil corporation Macht-Tec. Using their vast resources and stealth-armies, they set out on a mission to capture Priestess’s for their power. Amidst all this, a young swordsman named Xeros appears with no memories of his past, and a strange power that rivals those of the mighty corporation. He is now their main target. Sonic PUZZ is a puzzle game made in RM2k3 designed to feel like a retro puzzle game. In Sonic PUZZ, the player must complete 3 tasks to advance to the next stage under a specific Time Limit. On a distant planet far away from earth, the remaining colonists of a small Human village fear for the return of the strange planet’s evil creatures. All three of these titles are expected at SAGE. We’ll be there to cover this and many others showing up.